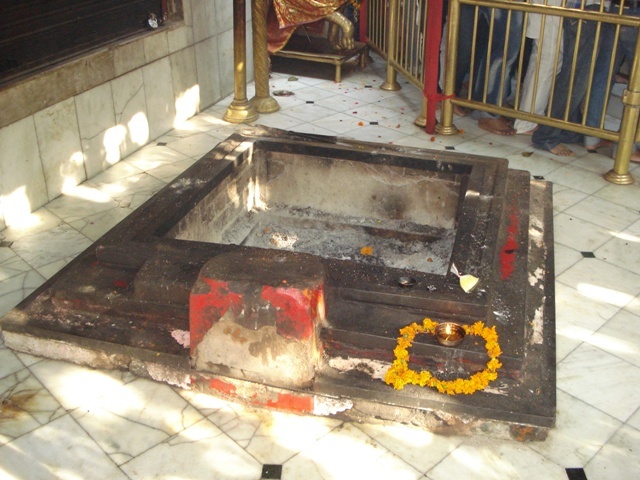 Chintpurni Temple - Jai Maa Chintpurni Ji! Jai Maa Chhinnmastika Ji! The path from the Chintpurni bus stand towards the Bhavan (main temple) passes through a busy market. Devotees may buy their offerings for Maa from the shops along the path or choose to bring some of their own. Please read more at our Offerings section to see the various offerings that are made by devotees. 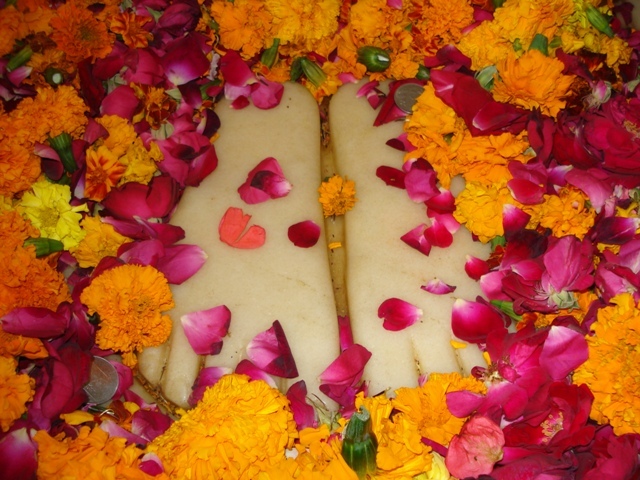 Usually devotees would leave their shoes and other items at the shops they buy their offerings, and take them back when they return after the darshan. A flight of stairs leads to the main entrance of the Bhavan. The entrance faces North. In front of the entrance is an age old Banyan tree. 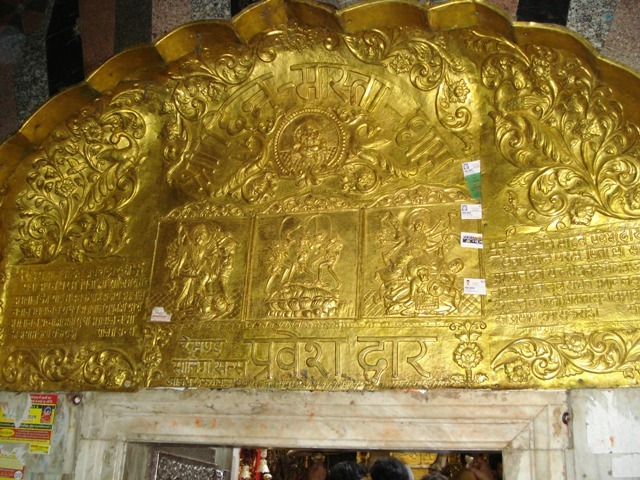 On the sides of the entrance are the idols of Lord Ganesha, Lord Shiva, Lord Bhairon and Lord Hanuman. Devotees would bow down to them before entering the Bhavan. 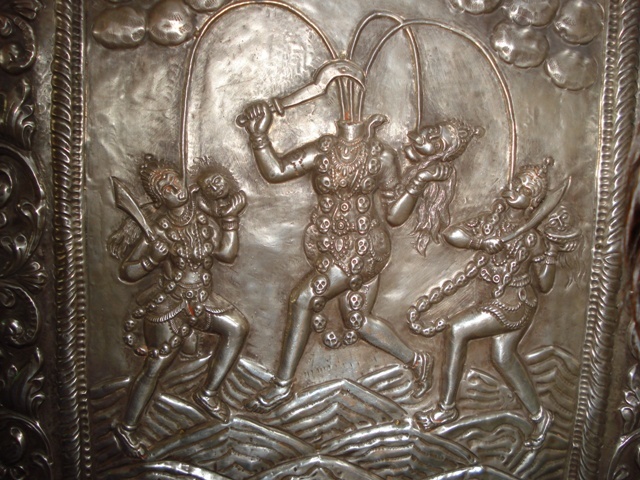 The door is silver plated and is engraved with figurines of Maa Chhinnmastika Herself and Lord Ganesha, Lord Hanuman along with other dieties. Just inside the entrance door are huge brass bells hanging above for the devotees to toll as they enter. A few steps from the entrance is the main room of the Bhavan where Maa Chintpurni is enthroned in the form of Pindi (a round stone idol), under the old banyan tree where Pandit Mai Das had the divine darshan of Maa Chhinnmastika. The Pindi is placed in a palanquin of white marble inside this room. 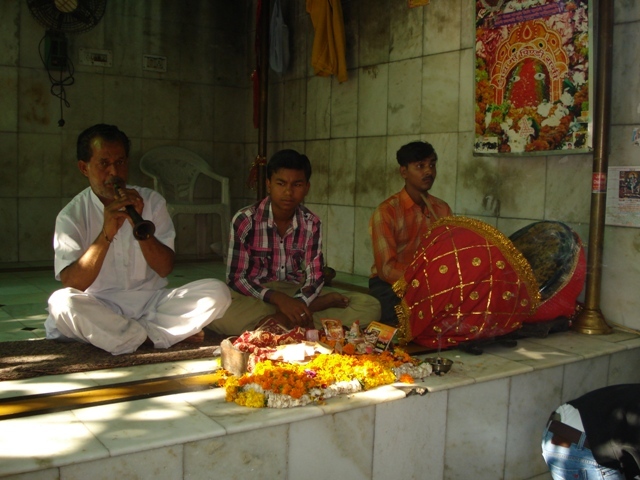 The devotees pay their homage to Maa Chintpurni here and the priests from the Pandit Mai Dass clan peform the pooja and offerings on behalf of the devotees. 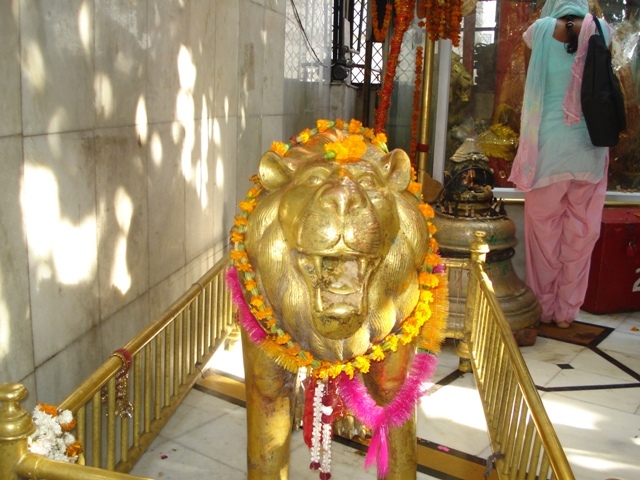 On the roof of the temple, along the dome, are the stone images of Lord Bhairon and Lord Hanuman. The dome was gold-plated by one of the devotees a few years ago. Around this temple room spreads the big old banyan tree. It is a belief that if a devotee ties mauli (a sacred red cotton thread) on this tree and asks for a wish, his or her wish shall be granted. The devotee shall then return to untie the mauli from the tree after the wish has been done. Maa Chintpurni always listens to Her children and grants them their wishes. 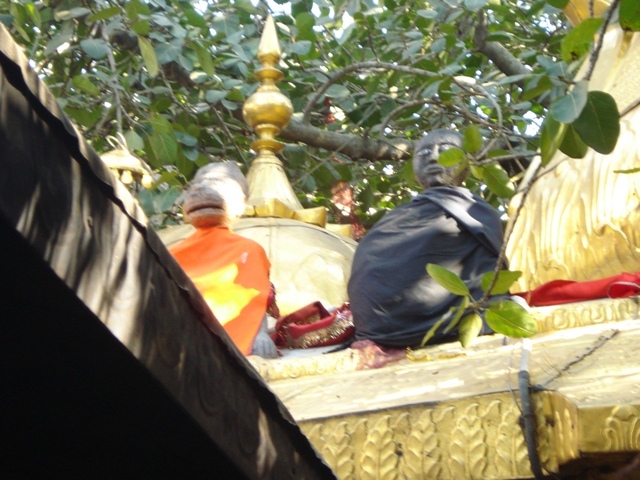 Under the tree, on one side, is the place where the Prasad is distributed to all. A large hall has been constructed towards one side for the devotees to sit down and pray or rest. Outside the hall is an idol of Maa Santoshi Ji. 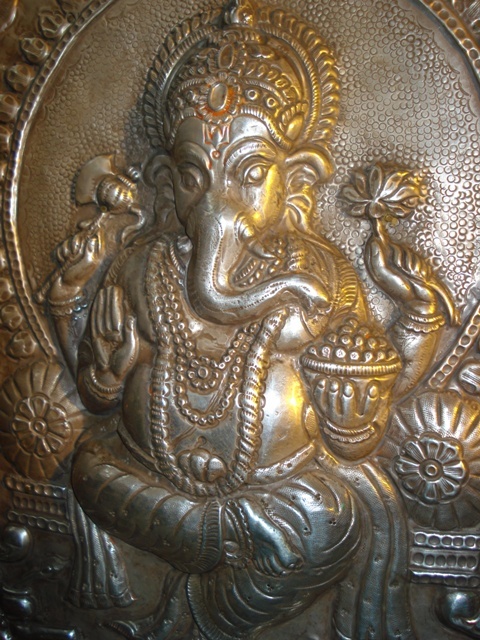 On the other side of the tree are placed the idols of Lord Ganesha and Lord Hanuman. There is also a huge brass bell placed inside the premises which was donated by one of the devotees. There are 84 other bells of varying sizes which represent the 84 lakh births that a soul has to go through. In human form we, as devotees, get a chance to obtain the blessings of our Maa for salvation from these rebirths. There is a place to perform the Hawan in one corner. Towards the west, two persons are seated playing small drums and shehnai. Also sometimes young girls are singing Mata ki Bhentein (songs in praise of the deity). A silver plated exit gate is towards the west shall lead you out of the Bhavan and back to the market place.